Professional cabinet and furniture makers have used wood screw lubricants for over one hundred years. This simple but effective technique saves them time and money. 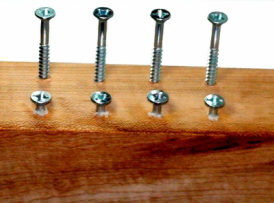 Wood screws & fasteners are easier to drive, screw heads are harder to strip or break and the wood is less likely to split. Our unique beeswax-based formula is soft, sticky and non-flaking. It outperforms the competition...including plain beeswax. Eliminate tired and sore hands. Eliminate scuff marks on your projects. Prolong the battery life on your cordless drill. Screw Wax™ is made from 100% natural waxes and is environmentally and ecologically safe. None of its ingredients are on the California Prop 65 list. What makes a great wood screw lubricant? MSDS sheets are available via our Contact Page or contact your retailer directly.